Thanks to two Montrealers’ deep love of art and a personal appreciation of how it can heal, 40 serene watercolours painted by students of McGill’s School of Architecture Sketching School now bring a welcome diversion for patients, staff and visitors of the Royal Victoria Hospital. Several years ago, Earl Pinchuk and Gary Blair spent many months at the Royal Victoria Hospital comforting their dying friend, Yves Larouche. Larouche was an artist who had inspired Pinchuk to explore art. During this period, Pinchuk was curating an art exhibit and noticed a lot of artwork was going unseen in artists’ studios. This got Blair and Pinchuk thinking that there was a way to make the hospital a more, well, hospitable place. The long, bare corridor walls were in need of the energy, inspiration and escapism that art provides. They would be a perfect place to hang artwork. Soon after, Pinchuk and Blair launched the Art for Healing Foundation and began thinking of ways to attract donors for permanent art installations in hospitals. “We wanted art to have an impact on people, especially for those who might not make it out to a museum or art gallery,” said Pinchuk recently. The pair approached and were approached by collectors, artists and art education institutions whose student projects often lay in storage. 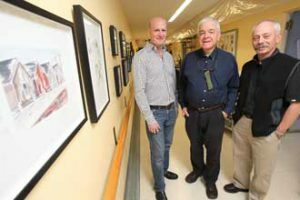 Thanks to their efforts, 4,500 works of art now grace the walls and halls of 40 institutions in Quebec, Ontario and Newfoundland, including hospitals, homes for the elderly, rehab centres, psychiatric institutions and more. “What we’re doing gives people going through a stressful time a space where they can be distracted and learn about art,” Pinchuk explained. McGill architecture professors Ricardo Castro and David Covo were keen to collaborate when they learned of the foundation’s work. “I’ve never seen anything like this in the world. What the Foundation is doing is incredibly novel and it can help stimulate those who pass through these institutions in such constructive ways,” said Castro. Rory Gullan, now a graduate of the School, served as a liaison between the Foundation and the students. He collected 80 sketches donated by students who attended the 2007 Sketching School and who were eager to share their work in an otherwise unlikely but wanting environment. Author and McGill architecture graduate Helen Malkin, who is on the Foundation’s board, contributed her expertise in selecting, framing and curating the McGill School of Architecture installation, as well as several other projects. The installations’ detailed scenes of Prince Edward Island are captivating. “When these sketches are framed, it really highlights the quality of the work,” said Castro.